Americans feel better about their personal finances today than they did a year ago, and they’re more confident about the future. Just over half of Americans express moderate to high satisfaction (53%) with their current financial situation, little changed from 51% a year ago. The number that feel very satisfied, however, has jumped from 24% to 33% of Americans. There has been an even bigger jump in those who report feeling highly confident about their financial situation looking to the future, from 38% at this time last year to 50% this year. 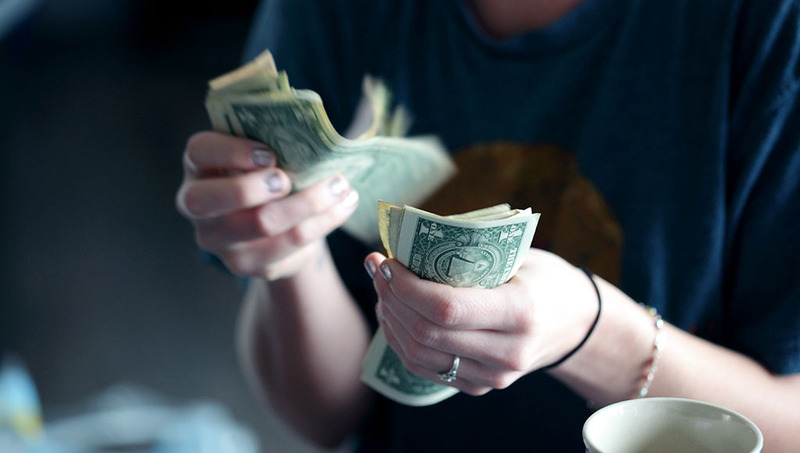 The boost in positive feelings about personal finances is not universal. There remains a significant minority of Americans who are deeply dissatisfied with their current finances (28% in 2017 compared to 29% in 2016) and highly anxious (31% in both 2017 and 2016) about their personal financial situation. 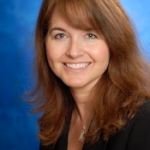 We can point to several possible explanations for the boost in financial confidence during this year of change. The continuing improvement through 2016 in economic fundamentals like employment and wage growth has been matched by a stock market rally and a new federal administration that has made big economic promises. But the good feelings are not universal; there remains a discouragingly large portion of Americans who are seriously struggling with their financial circumstances, feeling anxious and vulnerable. Overall, we’ve found that there are two different sets of financial experiences for Americans. 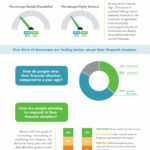 While greater confidence for the future is evident across Americans of all ages, there are wide discrepancies by generation when it comes to how they are feeling about their current financial situation. Millenials (those under 35) are most likely to perceive their financial situation as better today than a year ago. They are also more likely than older Americans to be highly satisfied and confident about their future financial situation. While more Millennials display financial confidence, there also has been a jump in the proportions expressing anxiety and vulnerability. Different parts of the same age cohort have experienced opposite reactions. Boomers (those over 55) are less likely to perceive a big change in their financial situation, despite a significant increase in financial satisfaction over the last year. Gen X Americans, those in the middle, aren’t feeling the same way. This generation is in fact more glum about their current financial situation than they were a year ago. Yet, like their older and younger counterparts, the past year has made them more confident about managing their situations. The increase in financial confidence and satisfaction across the U.S. population as a whole appears to reflect a more positive outlook among those who previously felt lukewarm about their financial circumstances. This group now feels good. At the same time, those at the lower end of the spectrum still see their financial outlook as bleak. One finding may point to an explanation for these feelings. 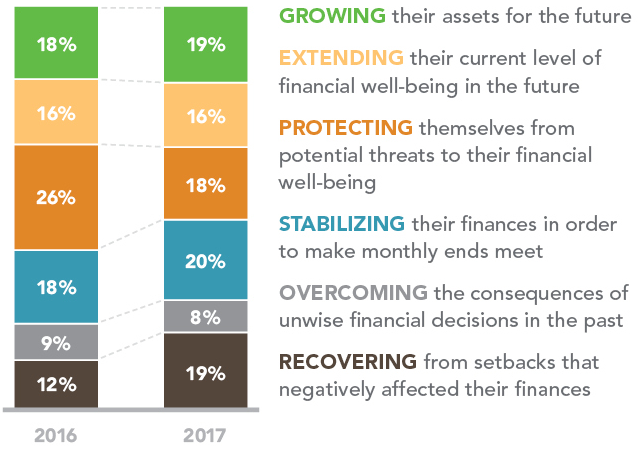 Nearly half of Americans—those who feel more anxious and vulnerable about their current financial situation—describe their most important personal financial goal as either recovering from prior problems or seeking to stabilize finances. On the other hand, just over half display financial confidence by describing their goals in more positive terms: expanding or protecting what they already have. This distinction—between those searching for stability versus those protecting what they have—is a central feature of the American financial landscape today. View all results in our infographic. As always, informative and clear. Thanks for reading and for your comment, Mike.